BARBERVILLE, Fla. (February 6, 2019) – It took Bixby, Oklahoma’s Shane Stewart eight laps to track down race leader, Daryn Pittman, from the inside of row three, but once he found the back bumper of the Roth Motorsports entry, it was the end of the road for Daryn Pittman, as well as the rest of the field. Stewart, driver of the CJB Motorsports/GoMuddy.com/Big Game Treestands/High Performance Lubricants/Weikert’s Livestock/No. 5 sprint car, opened the 48th Annual DIRTcar Nationals at Volusia Speedway Park with an Ollie’s Bargain Outlet All Star Circuit of Champions presented by Mobil 1 triumph; a tenth-career victory for the Oklahoma-native against the traveling All Stars, collecting $5,000 in the process. For Stewart, the signature Gator Trophy was extra special, as it was his first during a long and storied career. Although forced to start fifth on the feature grid, Stewart was on the hunt early, actually climbing his way into a podium spot by the completion of lap three. Less than a circuit later, Stewart was in a tight battle for second, eventually working his way around Nashville, Tennessee’s Paul McMahan before setting his aim for the Roth Motorsports entry driven by Daryn Pittman. Fortunately for Stewart, the main event’s first and only caution appeared just one lap later, thus erasing Pittman’s near-two second command over the field. Green flag action soon returned giving Stewart a clear shot at racing his away around Pittman. Although Pittman escaped in clean air, Stewart was able to track down his fellow Oklahoma native to less than a car length by lap eight. Utilizing the bottom groove of the speedway, Stewart set up his winning pass as the lead pair entered turn three on lap nine. His momentum on the bottom of the speedway proved beneficial as Stewart was able to power his way across the track, slide in front of Pittman and take command by the exit of turn four. Although Pittman kept pace with Stewart until the midpoint of the 30-lapper, actually executing two attempts to regain the top spot as the lead duo raced through traffic, Stewart’s momentum on the topside soon took over and he eventually pulled away. In fact, Stewart’s command grew as the laps counted down, ultimately crossing under the final checkers by a margin of victory equalling 3.8 seconds. Daryn Pittman held on to finish second, followed by David Gravel, a hard charging Donny Schatz from 22nd, and Logan Schuchart. 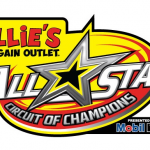 The Ollie’s Bargain Outlet All Star Circuit of Champions presented by Mobil 1 will conclude their winter vacation in the Sunshine State with one final visit to Volusia Speedway Park on Thursday, February 7. Tony Stewart’s All Stars will headline DIRTcar Nationals competition once again, chasing yet another $5,000 payday. Allowing Mother Nature to make the transition into more seasonable temperatures, the All Star Circuit of Champions will not return to competition until Thursday, April 11, when the Series makes the trip to southern Virginia for a one-night stand at Virginia Motor Speedway.